Flash Gordon and Ming "Mego" Style? Happy holidays from the Bif Bang Pow! team. As you may know, we've released some fantastic Alex Ross designs of action figures from the iconic 1980s film Flash Gordon. At San Diego Comic-Con 2009, we revealed a prototype "Mego" style "retro" 8-inch Flash Gordon action figure that we could make. There has been some internal debate, however, that we'd like your opinion on. If we made these action figures (Flash and Ming), what head sculpts should we use? We could make these figures using head sculpts based on the original 10inch design that Mego released in the 1970s, OR we could make all-new head sculpts based on the actors from the film. You decide. Take our poll now at bifbangpow.com on the front page, directly to the right of the "Where to Buy" section. UPDATE 12/22/2009 - The poll has now closed. You have been heard. All-new movie sculpts win by far! Thank you for participating. 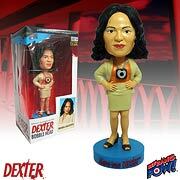 New Bobble Heads from ABC's LOST™ announced! 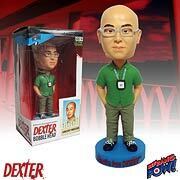 Available for pre-order now, check out our latest bobbles heads from LOST™. Dr. Edgar Halliwax, Daniel Faraday and Richard Alpert are all coming soon! We haven't talked in a while, so I wanted to let you all in on some groovy secrets. Firstly, I wanted to tell you to keep a close watch on the BBP! blog and all of our activities, because some HUGE news is coming down the pike very soon. You know us, we never do anything small, and this fall's news is no exception. It's a great site, and all the bloggers have alot of fun stuff to write about, so I hope you dig it. All right, enjoy yourselves, and as always with Bif Bang Pow!, expect the unexpected! Cause it's coming!! Our 'Dexter' figure comes to life!! Greetings, members of the Bif Bang Pow! Army! Hey mom! We're in TV Guide!! Hey BBP! 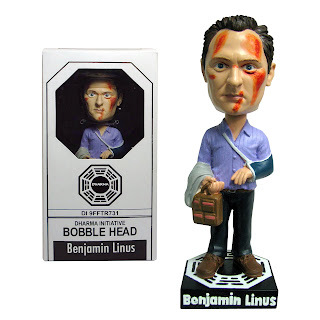 friends, fans and family, check this coolness out: our brand new, 2009 Comic Con debuting 'LOST' Ben Linus bobble head got featured in none other than TV Guide! And since there were soooo many exclusives on show, and only a couple made it into it's hallowed pages, I'd say we can sit at the cool kids table in the cafeteria this fall. Bif Bang Pow! in TV guide. How's THAT for a slice of fried gold? Another year, another Comic Con! Hello Bif Bang Pow! fans and followers! Jason Lenzi here, and I know it's been waaaay too long between posts, so apologies up front. Hopefully this message and all the gear we've been working on will somehow make up for our neglecting you these past few months. Well, once again, Bif Bang Pow! was bigger and better this year at the 40th Anniversary of the San Diego Comic Con, and it seemed the fans just couldn't get enough! We had not one, not two, but EIGHT different exclusive SDCC items, from 'Dexter', 'The Big Lebowski','Flash Gordon' and our newbie, 'LOST', and the loyal BBP!-ers seemed to pick 'em all up! 'Dexter' definitely got most of the buzz, helped in no small part by creepy baby faces everywhere you looked and the hottest tote bag of the con, but Ben Linus and his bobbling, beat up little head wasn't far behind. We also got some great feedback on all the prototypes on display, and debuted our very first two character figures from 'LOST', Jack and Sawyer, and if reaction is anything to go by, they're going to join the ranks of other BBP! winners the Dark Defender and The Dude Unemployed and make a very special mark in the action figure world. But as they seem to say in every Oscar acceptance speech, we certainly couldn't have gotten all of this accomplished by ourselves, so I'd like to thank: all the good people at Showtime for putting together such an amazing campaign and creating such buzz; Michael C. Hall, Julie Benz, Jennifer Carpenter, CS Lee, David Zayas, John Lithgow and James Remar for being the best, most fan friendly cast ever; the producers and licensing folks at ABC for getting Jack and his buddy out and onto the shelf; CBS for help with all things 'Twilight Zone'; Universal and Beanstalk for help with His Dudeness, and last but far from least, all the fans that came by to make purchases, check out our stuff, get pictures and blog about our merchandise, and take a few extra minutes to thank us for making some of their collecting dreams come true. I know we keep saying it, but trust me, next year will be even bigger. Now if you'll excuse me, I gotta rest up for it! Lost Figures Found at Bif Bang Pow! LOS ANGELES, CA (June 25, 2009) – Bif Bang Pow! 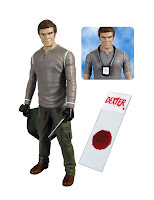 unveils the first in a line of collectibles based on the immensely popular ABC series Lost at Comic-Con International: San Diego 2009. And there's more to come with a special array of bobble heads and articulated action figures with story-specific accessories already in the works. "The twists, turns, and multiple threads that characterize Lost give rise to a host of distinctive and unforgettable characters. 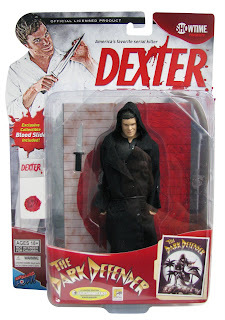 These characters lend themselves to the creation of unique figures and accessories that have terrific fan appeal and serve to memorialize this exceptional TV series," said Jason Lenzi, CEO of Bif Bang Pow! "We're thrilled to be bringing new bobble heads and poseable action figures to market in the vein of what Bif Bang Pow! has done with licenses in the past. As always with Lost and Bif Bang Pow!, expect the unexpected!" Lost stars Naveen Andrews as Sayid, Henry Ian Cusick as Desmond, Jeremy Davies as Daniel Faraday, Michael Emerson as Ben, Matthew Fox as Jack, Jorge Garcia as Hurley, Josh Holloway as Sawyer, Yunjin Kim as Sun, Ken Leung as Miles, Evangeline Lilly as Kate, Elizabeth Mitchell as Juliet, and Terry O’Quinn as Locke. Lost was created by Jeffrey Lieber and J.J. Abrams and Damon Lindelof. Abrams, Lindelof, Bryan Burk, Carlton Cuse, Jack Bender, Edward Kitsis, and Adam Horowitz serve as executive producers. Lost, which is filmed entirely on location in Hawaii and premiered on September 22, 2004, is from ABC Studios. ABC Studios is a leader in the development, production, and strategic distribution of entertainment content across television and emerging digital platforms. As a key content driver for the Disney-ABC Television Group, the studio will produce 19 productions for broadcast and cable television in the 2009/10 season. Bif Bang Pow! (bifbangpow.com) produces first-rate collectibles for such popular properties as Dexter, Lost, Californication, The Twilight Zone, The Big Lebowski, and Flash Gordon. Founder Jason Lenzi is a seasoned television producer and the ultimate fan of cultish pop culture. So when he created his company in 2005, he took the fan's perspective. His idea was to bring items to the marketplace that he himself would want to own. Cultivated from TV, movies, books, comics, music, and more, Bif Bang Pow!’s mission is to provide high-quality action figures, toys, and collectibles to the massive cult audience (and kids of all ages) that wishes these toys were already in their collection. Bif Bang Pow! is a unit of JLA Direct, LLC. Skip to 1:22 - then enjoy the interview from the man himself! First look! Dexter in a box! Bif Bang Pow! Explodes at Comic-Con! LOS ANGELES, CA (June 16, 2009) – Comic-Con International celebrates its 40th anniversary, and Bif Bang Pow! 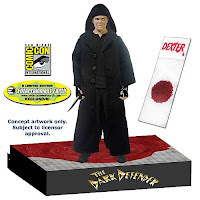 's booming line of collectibles from Dexter™, The Big Lebowski™, and Flash Gordon™ explodes at Comic-Con International: San Diego 2009 with the unveiling of seven brand-new, limited edition, SDCC Exclusive action figures… plus bobble head product debuts from The Twilight Zone™ that add to the buzz. Available only at the Entertainment Earth® booth #2343. Prices include sales tax, and per-person limits may apply at the show. "As Comic-Con International celebrates its 40th anniversary, Bif Bang Pow! is adding to the festivities by commemorating the 75th birthday of Flash Gordon™ and the 50th anniversary of The Twilight Zone™ with one-of-a-kind convention exclusives and first-look debuts based on these and other popular properties like Dexter™ and The Big Lebowski™," said Jason Lenzi, CEO of Bif Bang Pow! "We're proud to be a part of Comic-Con again this year and to make SDCC the venue for these electrifying new releases. Expect more of the unexpected from Bif Bang Pow!" 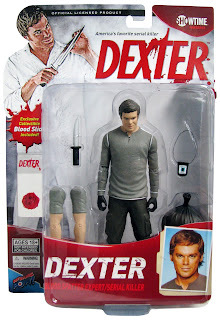 Our Dexter action figure has been making the rounds. It landed a spot in TV Guide in early May, and now our Entertainment Earth Exclusive Dark Defender action figure (just announced) is the #1 most anticipated exclusive at San Diego Comic-Con 2009 (and we can assure you that many more exclusives were submitted for this list). Click this link to pre-order (while supplies last), or check out page 36 on this PDF (page 34 is the actual page number). Hey gang, Jason here to brighten your day and bring you great 'Dexter' news. We're adding to our ever popular 'Dexter' bobble head line, with two more characters from the Miami Police Homicide Division: Lt. Maria LaGuerta and Vincent Masuka! That's right, the toughest division head and the creepiest lab tech on the force are now available for pre order, and they're going fast! Since you already have the rest of the characters (you do, don't you? What?? Well what are you waiting for? ), it'd be silly not to get these two new beauties. Both have all the detail you'd expect from Bif Bang Pow!, and have been personally approved by the actors themselves. So grab 'em while they're hot! Then get 'em home, and pretend that Masuka says something completely inappropriate to LaGuerta, and gets bopped on the bobble. Ahhh, playtime with 'Dexter'. Such fun! Ok, Bif Bang Pow! fans. I warned you that the news was going to come fast and furious in the next couple of months, and here's another doozy for you. It's time to debut the first two items from our 'Twlight Zone' collection: The Invader and The Mystic Seer! After much hard work and meticulous research, we're really excited at how they've turned out. Now, notice how I didn't call them 'bobble heads'? That's because we think slightly outside the box here at BBP!, which is probably why no office can hold us! While the Mystic Seer COULD technically be called a 'bobble head', because the little devil head does indeed 'bobble', we think you'll agree it's a unique item and way to present this iconic piece. As for the Invader, being a stocky little fellow, he 'bobbles' at the waist, for that "walking on an alien planet" action. 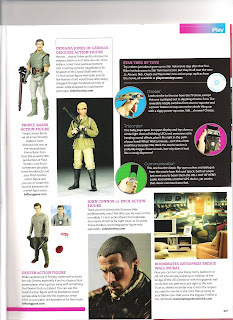 ... a dimension of the coolest collectibles anywhere! Hello everyone, Lenzi with you again, to give you some of the most exciting news to have ever come out of Bif Bang Pow! headquarters. We are proud to announce we've obtained the license for one of the greatest properties ever conceived: 'The Twilight Zone'. Just in time for the iconic series 50th Anniversary, we'll be producing collectibles from the series in the form of statues and bobble heads-but some will have, let's say, 'special' twists to them, much like the series itself. And most exciting of all, for the first time, we'll be bringing the world 3D representations of the man himself, Rod Serling. Serling is one of my personal heroes, and I couldn't be more excited about this property. 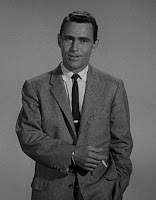 We aim to do the genius of Serling justice, both in our representations of him and the many creatures and characters that live in that fantastic universe. There's lots more news to come, but the first product should hit in time for San Diego Comic-Con 2009, and just wait til you see the exclusive we have planned. It'll have all the BBP! trademarks of quality and thinking outside the box. Or in this case, outside the normal dimensions. Bif Bang Pow!- officially entering the 'Twilight Zone'. Won't you join us? 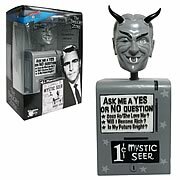 NEW YORK, February 25, 2009 – CBS Consumer Products, a unit of CBS Entertainment, announced today an anniversary program to celebrate one of the most influential series of our time – The Twilight Zone. The program will begin with five licensing entities who will develop merchandise in celebration of the TV show’s 50th birthday. Products will include a broad array of items including games, dolls, keepsake ornaments and even a 50th anniversary commemorative stamp. CBS is especially proud that the United States Postal Service is creating a 50th Anniversary commemorative stamp slated for release in August 2009. Additionally, UK-based game maker Gamaka© has licensed the rights to manufacture both a new interactive trivia DVD game as well as a board game inviting fans to test their knowledge of the classic series. The announcement comes just on the heels of Toy Fair 2009, as both games are set to hit stores this fall. 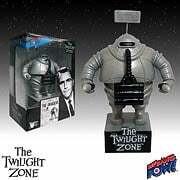 The Twilight Zone is part of a new branding initiative by CBS Consumer Products designed to bring together the greatest collection of classic TV icons ever assembled under one name: Television City. The new banner includes merchandise from TV’s most iconic properties including Cheers, The Brady Bunch, Happy Days and more. The creation of the Television City umbrella has made the brands more accessible to both consumers and retailers alike through distinctive packaging and signage. Currently, Television City is one of the largest classic television libraries in existence with well over 150 beloved shows. CBS Consumer Products, a unit of CBS Entertainment, manages worldwide licensing and merchandising for a diverse slate of television brands and series from CBS, CBS Paramount Network Television and CBS Television Distribution, as well as from the company's extensive library of titles. Additionally, the group oversees the CBS Retail Store and online sales of programming merchandise. For more information, visit www.CBS.com. 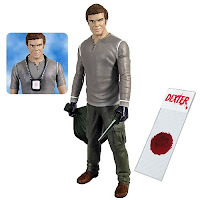 DEXTER action figure- it's official!! "Yes, and proud we are of all of them". Hello Bif Bang Pow! readers and achievers of all shapes and sizes! Jason Lenzi here again, with some very exciting news that you (and I) have been waiting a long time to read: Wave 3 of our Big Lebowski Urban Achievers action figures are up for pre-order right now! With new and improved images! 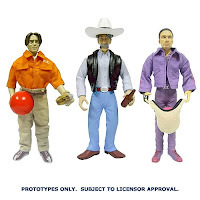 That's right, after nearly a year and a half of calls, paperwork, designs, hold ups, let downs, drinks, and heartburn, unveiled for the first time, are Donny, the Stranger and Jesus Quintana, in full regalia, over at the Entertainment Earth site, right now! They're crafted with the same loving care that went into our previous waves, and we think they'll look beeeutiful standing proudly next to Jeffrey and Walter (which you already have, right? Right??). From Donny's burger, to the Strangers bottle o' Sasparilla, to Jesus' handy ball cleaner, all of the details and accessories you know and love from the film are in place and ready to move into your office or home. So, like mama always said, 'good things come to those who wait'. Thanks for being patient, we think you'll be proud as well. Hey gang, Jason Lenzi here again, wishing you all a happy and healthy New Year (it's still ok to do that by the 14th, right?). Our pals over at WIZARD have gone and gotten us a surprise New Year's gift already, and we didn't get them anything! Not fair guys, we're embarrassed. But not too embarrassed to share the good news with the rest of you! 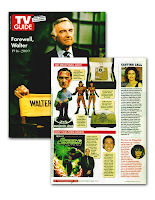 In the latest issue (# 208) of WIZARD, (THE pop culture bible, fans), they've put the Dude and Walter on their super cool NEXT! list. Yep, the magazine lists our Urban Achiever Big Lebowski Wave 2 and 3 as must haves, and our boys are rubbing shoulders with some of the coolest cats in the zeitgeist: DC Heroes, Marvel Heroes, and half nekkid girls like Sinful Suzi. And why not? According to the WIZARD gang, the Dude and Walter "could see no better interpretation than these exaggerated figures". Had we said that ourselves, we would've seemed big headed, so thanks WIZARD! So get out and buy the new issue of WIZARD so you can be up to date on all the coolest news that's fit to eat, and get over to Entertainment Earth and grab a set of two of the latest Big Lebowski figures. I strongly urge you to, because when you see the newest characters that are coming from 'The Big Lebowski' in '09, you're gonna want the whole set. Thanks again WIZARD, we're honored to be in the hippest mag on the stands!